We’ve passed the Winter Solstice, so although the daylight is still quite short, it gets a little longer every day and that makes the chilly dark winter days easier to take. 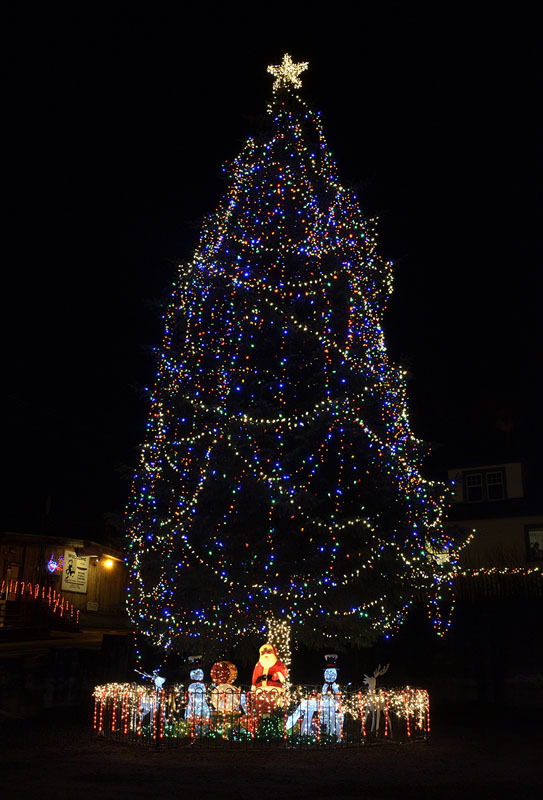 There are still plenty of lights up around town to keep things cheery and bright, and many people set their lights to turn on in the dark mornings as well as evenings. The Sons of Norway hall always looks good, reflected in the slough at high tide. We’ve had a few stunning sunrises this past week (today was the best! ), and it’s nice not to have to get up too early to see it. 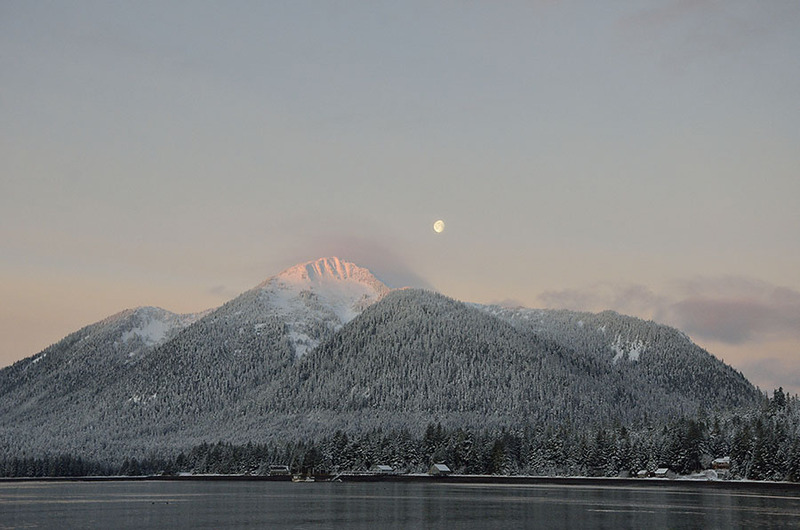 We even had some pretty moonsets right around sunrise last week – so beautiful with the dawn light kissing the top of Bearclaw Mountain. 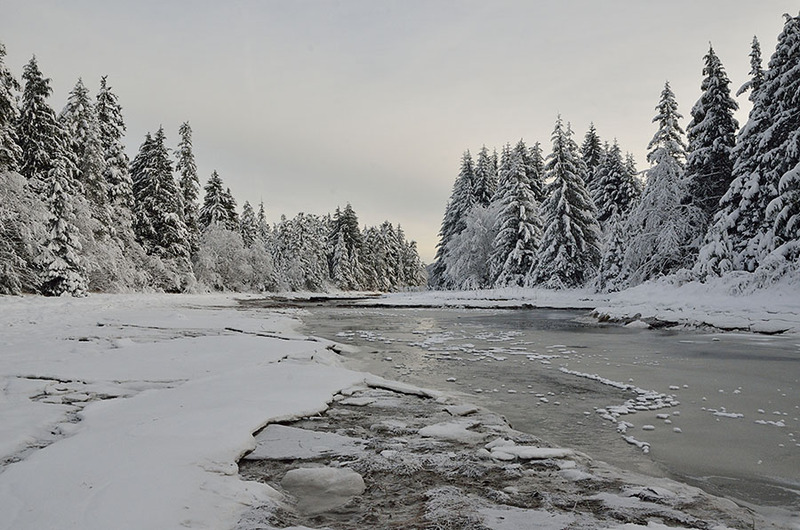 We had a few good dumps of snow starting the day after Christmas, turning the National Forest into a true winter wonderland. 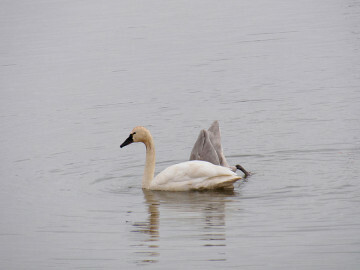 We headed Out The Road to explore the tidal rapids at Blind Slough and to see if we could spot any swans or other birds. 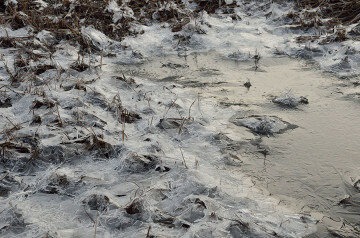 We saw lots of deer and mink tracks in the snow and some ducks flying in the distance, but no trumpeter swans that day. 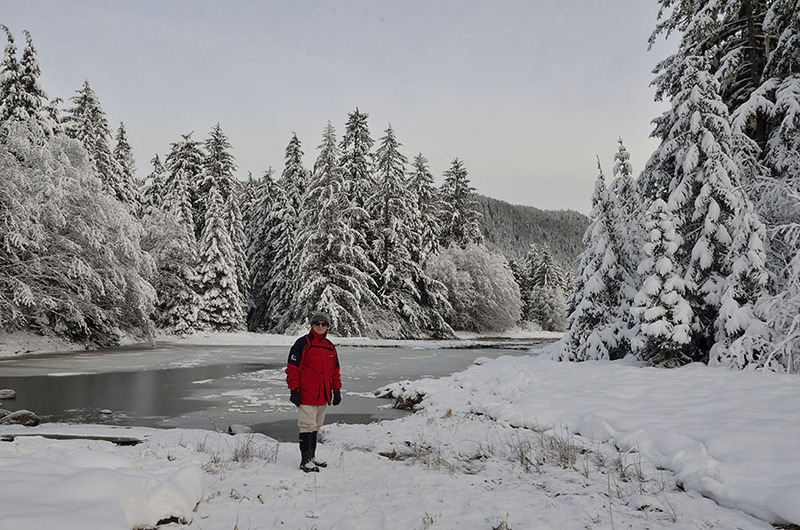 We had snowshoes with us, but didn’t need them since the shoreline of the slough was covered by a frozen crust that made walking pretty easy, and much of the trail was sheltered by tall spruce and hemlock so the snow wasn’t very deep. It was so quiet out there, with the sun quickly sinking below the edge of the mountains. We often stopped to listen and savor the quiet, but as we were heading back to the trail we heard lots of snapping and popping – very strange! We looked around and finally realized that it was the tide coming in, lifting the ice which had slumped and draped over rocks and grasses in the shallows. We were glad we ventured out to explore, though we’ve ordered a set of studded snow tires for the car to make future exploration a little safer. 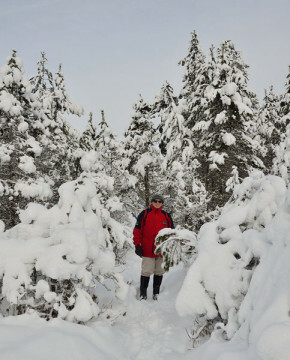 Everyone in town is hoping for more snow and a chance to make good use of cross country skis and snow shoes, and to enjoy the wintry landscape. 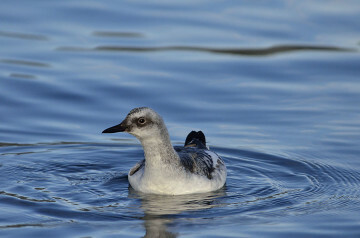 The winter birds are active in the harbor, with scoters, loons, goldeneye, teals, and the elegant long-tailed ducks. We’ve had a few blooms of krill in the water lately, bringing in even bigger populations of ducks and sea birds to the harbor. Sometimes I sit on the dock under a camouflage poncho with my camera to watch and photograph the birds, and it’s worthwhile to see them up close. There is so much beauty here – everywhere you look, and we’re grateful for the chance to enjoy it. 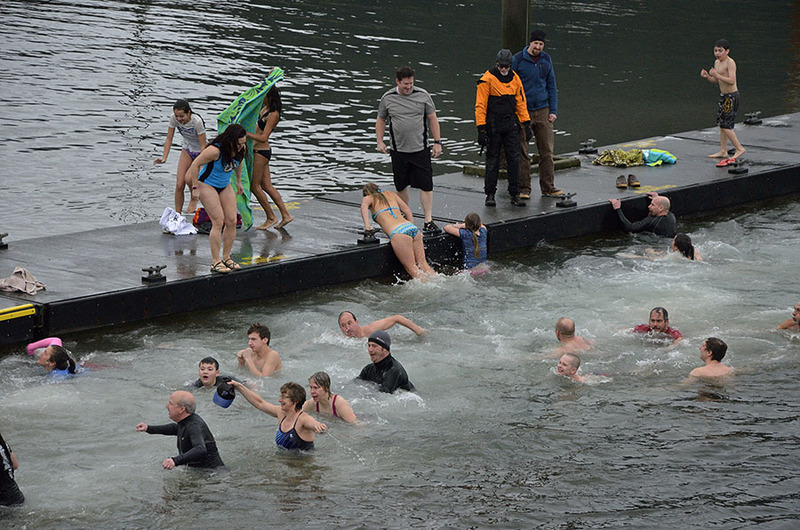 The New Year wouldn’t be complete without the annual Polar Plunge in the harbor. The intrepid swimmers gathered on a chilly, overcast New Year’s morning with the ambulance and a safety swimmer standing by. As the crowd counted down, the brave and the crazy took the leap! You might notice that a few people chickened out at the last minute, but we had a great range of ages represented among those who took the plunge. …and a couple of people lingered in the 48 degree water to relish the moment. Happy New Year! I think Petersburg (aka “Little Norway”), known to be more Norwegian than Norway, is just about the perfect place to spend Christmas. 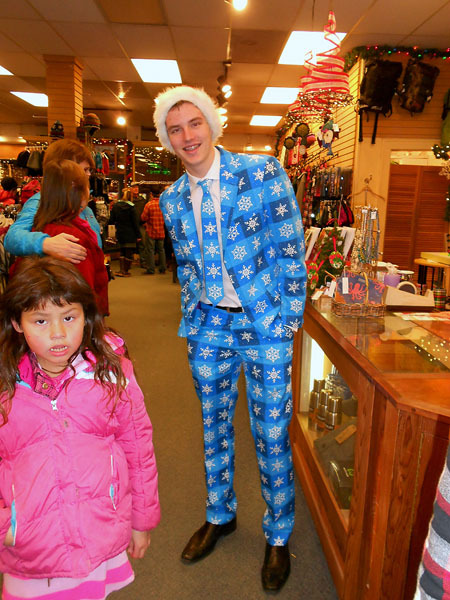 This community really knows how to do it right, from the high school and middle school holiday band concerts, to the dance recital (with 130 children ranging in age from 4 to 17), to the Community Concert, to Julebukking – it’s a festive and happy time. The Community Concert is a lovely event, where anyone can volunteer to perform something holiday-ish. The number of talented people around town is impressive enough, but then consider the generosity of those people willing to share their talents with the rest of us. 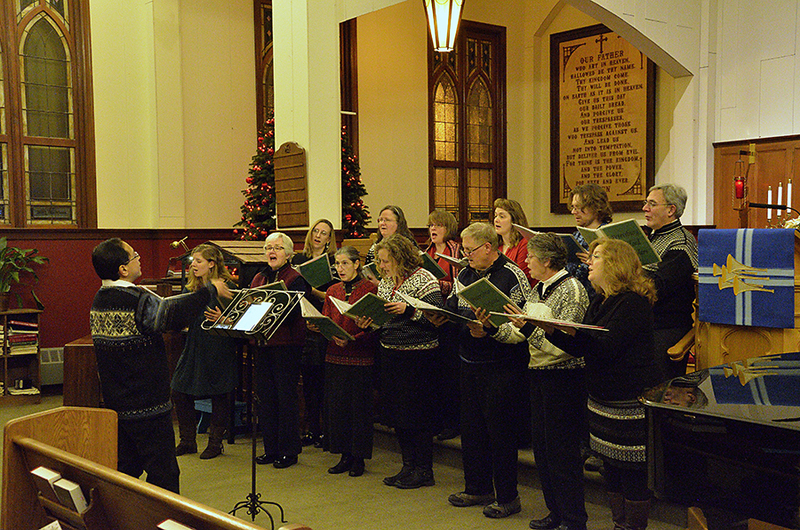 Jim volunteered to sing with the Oxford Carolers group, so he’s been busy with rehearsals all month, and they sang well at the Concert as well as a few other venues around town. 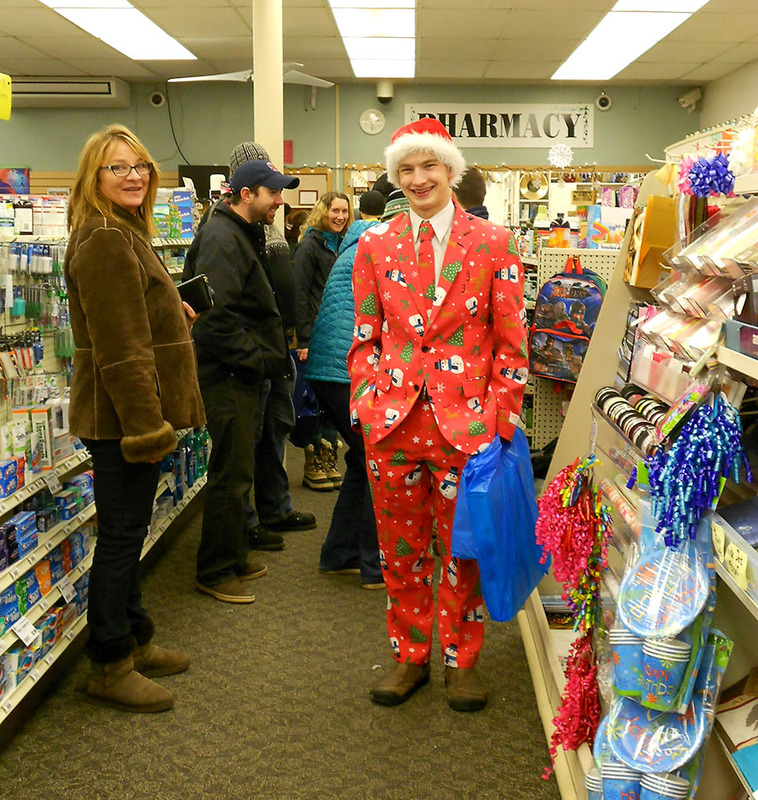 Julebukking is probably the most fun part of the holidays, where local businesses and organizations revive their own version of the old Norwegian tradition and host open houses with generous spreads of food. It started last Saturday with a couple of places, then picked up the pace with six or more businesses hosting each day on Wednesday and Thursday. It’s a great way to visit with friends and to make new ones while standing around enjoying the treats. 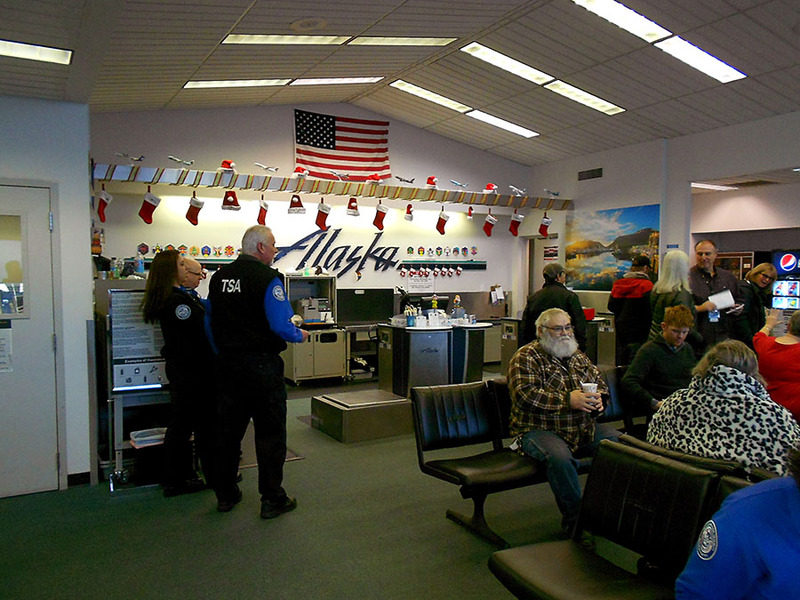 The airport even gets into the act, with a nice table full of smoked fish, meats and cheeses, and cookies as well as discount coupons from Alaska Airlines. In the old days, the passengers on the planes would come inside to enjoy some Julebukking, but with stricter security the gate staff just brings some plates of treats out to the pilots and crew. Our radio station (KFSK – Fish Head Radio) had baked potatoes, a fabulous cranberry tart, and cookies decorated by children. 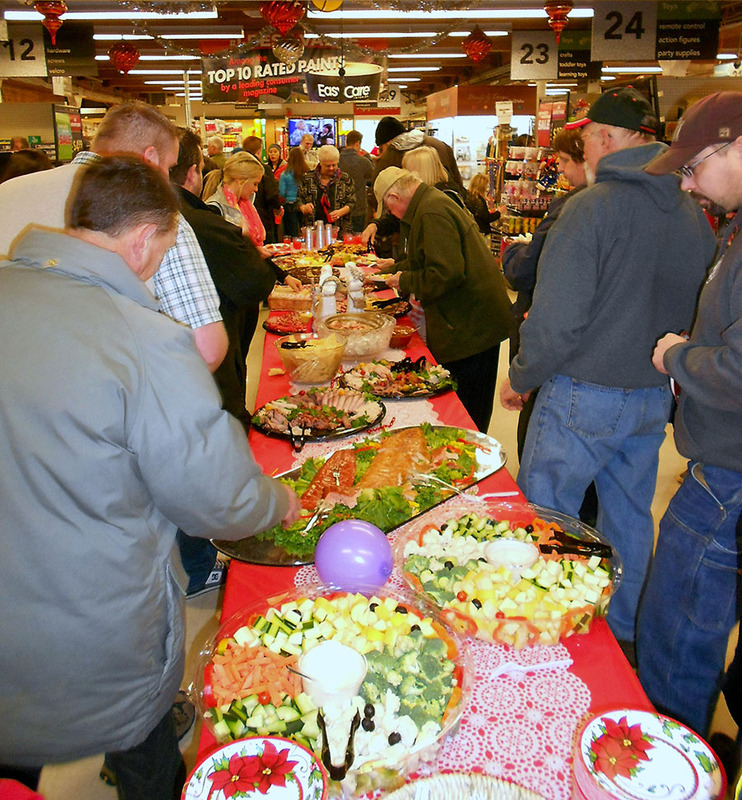 Each business puts its own spin on the festivities, but I would say that the Rexall Drug Store’s pastrami sandwiches (well worth waiting in a long line for) and the spread at the hardware store are the best. 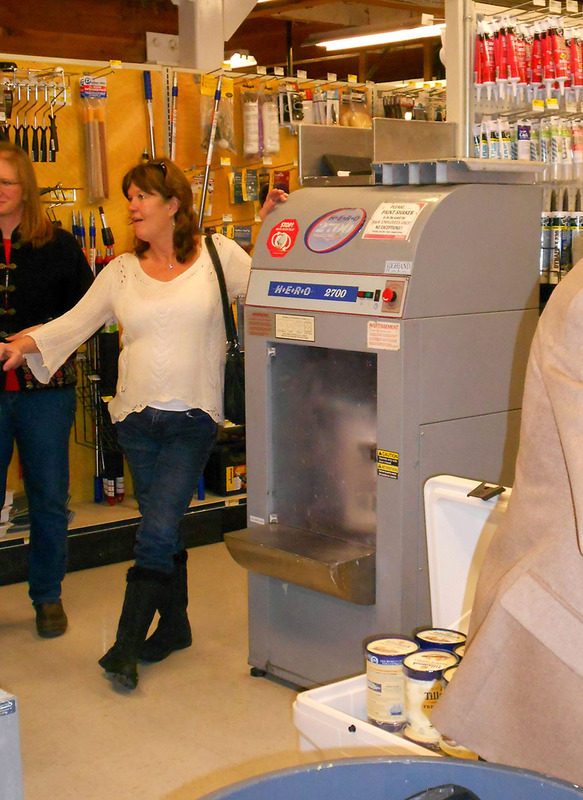 The highlight is the hardware store’s “Moose Milk” – a delicious concoction that is as much fun to watch them make as it is to drink. 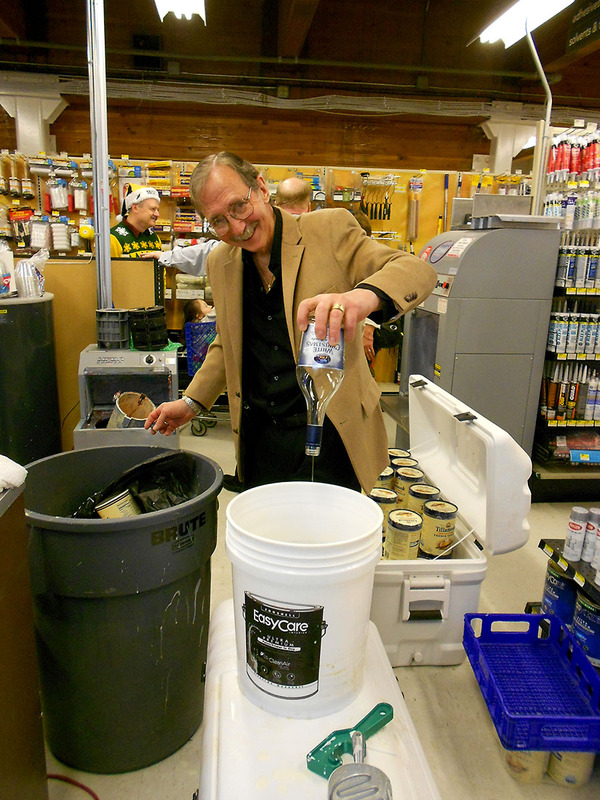 Start with a 5 gallon paint bucket and a smiling man pouring White Christmas liqueur into it. 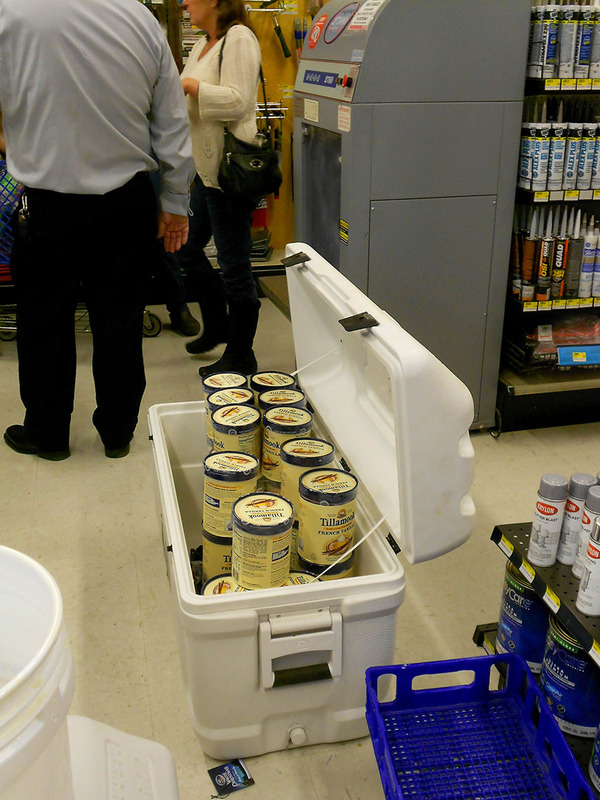 Add 6 half-gallons of vanilla ice cream, softened… Put the top on the bucket tightly, and stick it into the paint shaker for a little while…. 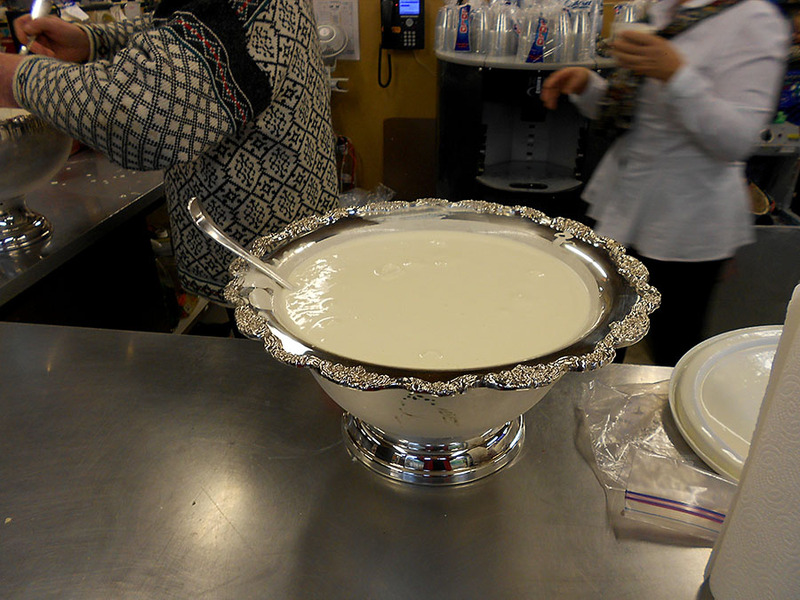 …and voila – you have Moose Milk! Norwegian sweaters are often the garment of choice for Julebukking, though some people celebrate the holidays with their own distinctive style. I don’t know if these two guys are related, but they sure looked great! If you want to know more about Julebukking, you might find the description on Wikipedia informative, and it even mentions Petersburg as one of the places that celebrates the tradition. After trying not to stuff our faces TOO much for days on end, we got into the proper Christmas spirit with a walk up to the Lutheran Church for the 10pm service on Christmas Eve. The moon was full, the skies were clear and full of stars, and the big dipper and Polaris were easy to see – a reminder of Alaska’s state flag. The temperature was in the low 20s, but the warmth of the congregation more than made up for it. There’s enough snow remaining on the ground to count as a “white Christmas”, though we’re likely to get some fresh snow later on tonight and into tomorrow. 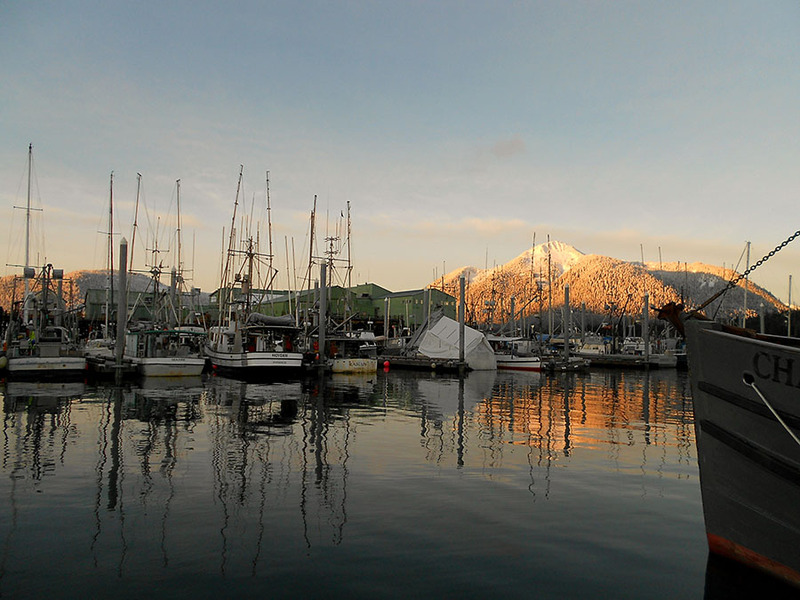 This morning we woke up to a pretty day, and as the sun crested the mountains to the east, it cast a golden glow on the crest of Petersburg and Bearclaw Mountains. We leave you with the view from the back of the boat shortly after sunrise at 8:30 this Christmas morning. May all your days be Merry and Bright! …of daylight today. The Winter Solstice was two days ago, so the days are getting longer once again! Today we’ll have one more minute of daylight than we had yesterday – which doesn’t seem like much, but the pace will pick up, adding 5-6 minutes a day of daylight by springtime. That’s enough to be very noticeable over a week’s time. Today the sun rose around 8:29, and it will set at 3:14 this afternoon. 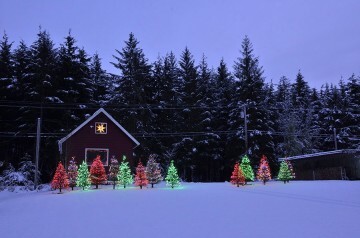 People tend to keep their Christmas lights up well into January – it helps to keep the “dark months” a little brighter. 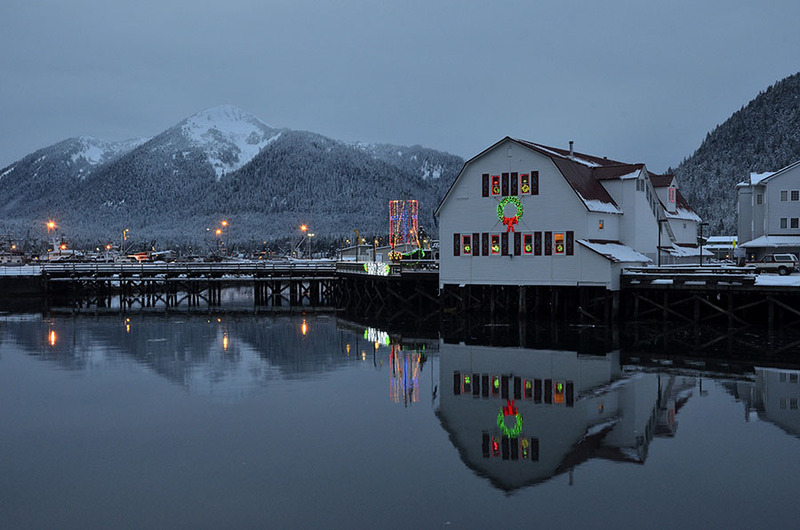 Jim and I want to wish you and your families a Joyous Holiday Season, and we send warm wishes from Petersburg, Alaska! While we’ve been busy traveling, then catching up from being away, and now dealing with the hustle and bustle of Christmas in “Little Norway” (more Julebukking today – where everyone eats their way around town), I haven’t forgotten about this Blog. I’m still digging out from under all the photos I shot on our fall trip to the Alaskan Interior, as well as the later fall trip back east. I promise to get the Blog caught up in the next week or two – so don’t be too confused by reading about September things in December (and January). The Dalton Highway is a haul road – built to provide a way for big trucks to carry supplies and material from Fairbanks north to Prudhoe Bay on the shores of the Arctic Ocean. It typically takes two days to drive the 414 mile road, only 1/4 of which is paved. 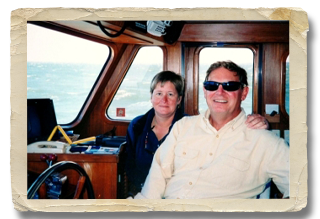 The only medical facilities are at the endpoints – in Fairbanks or Deadhorse/Prudhoe Bay. There is only one other place to buy fuel, at Coldfoot Camp about midway between. Traveling on this road is not for the faint of heart, and you need to be very well equipped and prepared. Notice the condition of the windshield – I took this photo out the front window of our tour van, and there were about 20 cracks or chips in it. 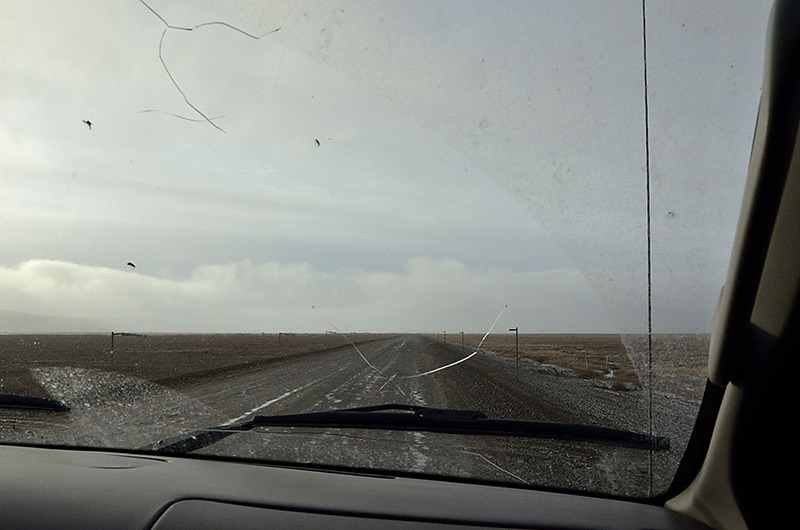 Unlike many states, it’s not illegal to drive around with a cracked windshield in Alaska, otherwise people driving on these rough roads would spend more on tickets than on replacement glass. We started our journey in Deadhorse, where Alaska DOT was raising and repairing the road after an unusual spring flood washed out a section, rendering it impassible for 18 days. 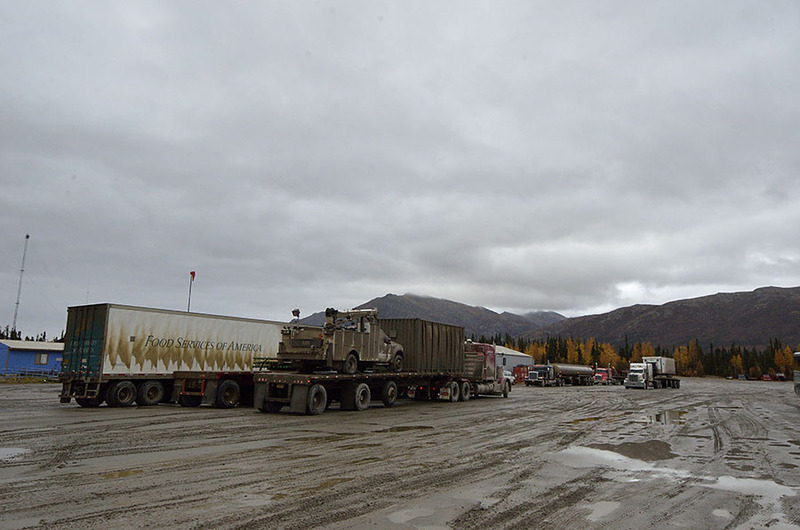 Prudhoe Bay nearly ran out of food and fuel – an extremely serious problem, so that section of the road will be rebuilt 7′ higher than before. Wildlife along the Dalton is varied – cackling geese, tundra swans, musk ox, brown (grizzly) bears, caribou, snowshoe hares and fox are common, along with other kinds of birds as we transited various ecosystems. It was hunting season so the musk ox and caribou were hiding, but we did see some owls, peregrine falcons, and harriers. 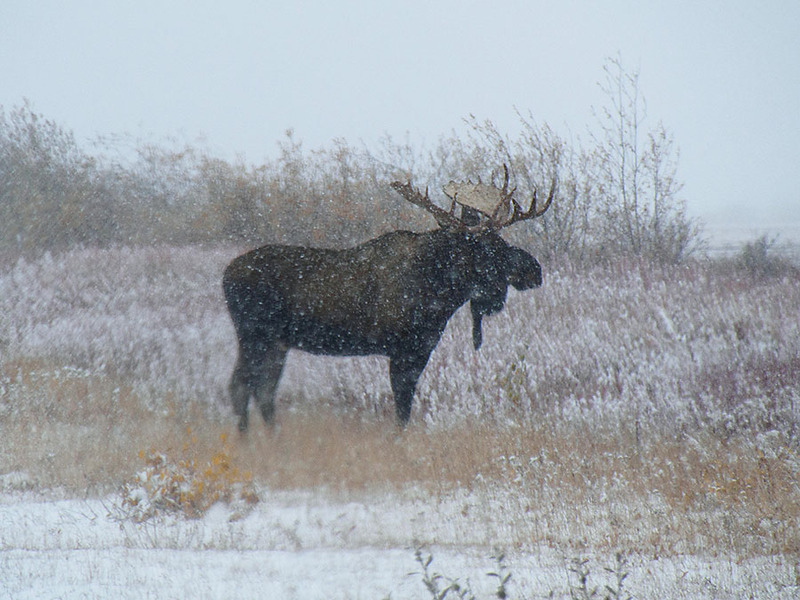 We were surprised twice, seeing moose in tundra areas where they’re not normally found. 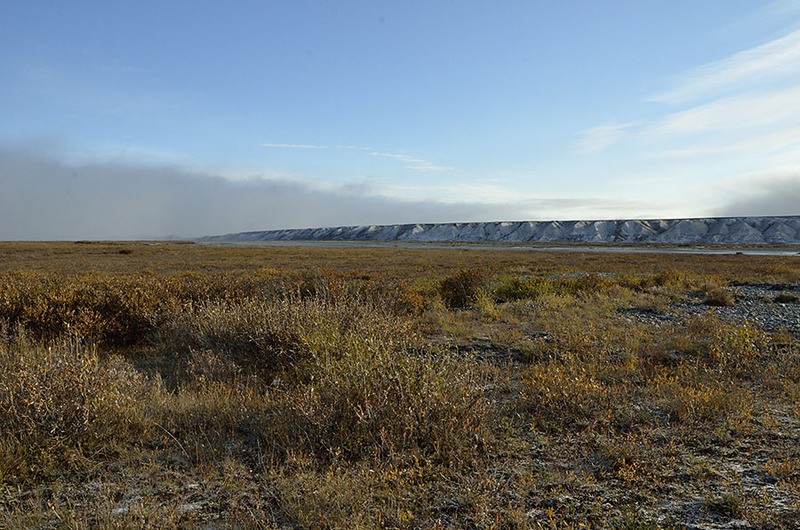 The scenery along the Dalton was so varied as we moved southwards – flat tundra, with a beautiful ridge of low mountains called the Franklin bluffs, along with pingoes – uplifted humps on the land. The northernmost mountain range in Alaska is the Brooks Range, and the Dalton (which shadows the Trans-Alaska Pipeline) crosses the Brooks Range at Atigun Pass – 4700 feet, and the only mountain pass that’s maintained all year round. 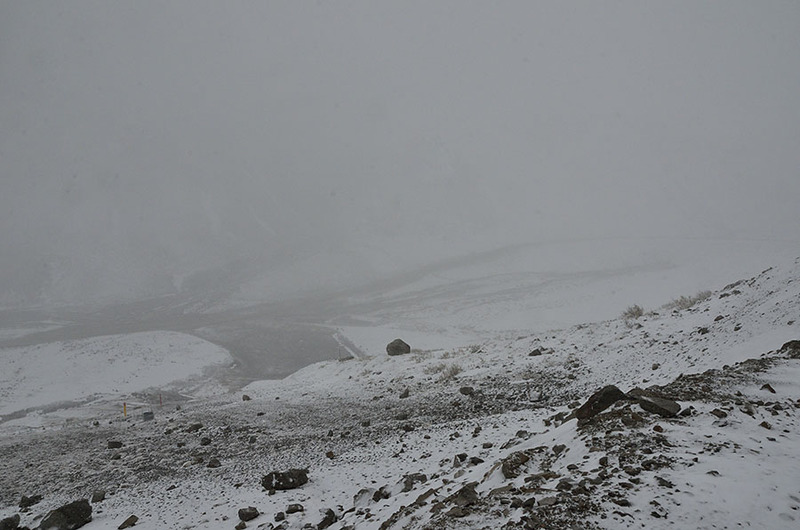 On the 9th of September, we encountered a blizzard coming over the pass, though the snow stopped when we got to the south side. 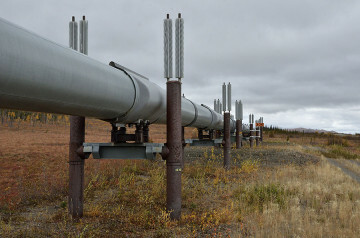 The pipeline follows the path of the Dalton Highway, visible about half of the time, when it’s above ground. The road and pipeline crosses permafrost, and it’s important that the permafrost stays frozen, lest the structures built on it become unstable. Different kinds of heat sinks are employed to protect the permafrost, as you can see by the fins on top of the pipeline supports here. There aren’t many places to stop along the Dalton, despite the 150-250 trucks per day that travel on the road. The primary overnight stopping point is at Coldfoot Camp, one of the few places north of the Arctic Circle that is accessible by road. Coldfoot got its name from the gold rush period, where hopeful prospectors often lost their resolve and got “cold feet”. Like Deadhorse, it’s a pretty spartan place, with an old, scruffy modular building that serves as a hotel, and a separate building that serves plentiful hot food. 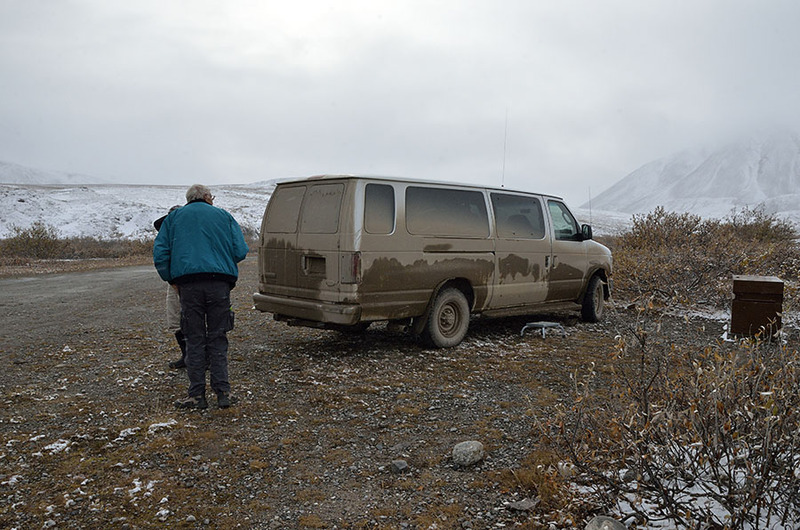 You can see the mud – every vehicle is quickly enveloped in mud driving on the Dalton, and our tour guide stopped several times a day to wash the windows on the van so we could see. 250 miles south of Deadhorse we crossed the Arctic Circle, pausing at a little roadside signpost to commemorate the event (even though we flew across it to get up to Deadhorse). Our guide read a passage from Robert Service, and a little gray jay looked on. 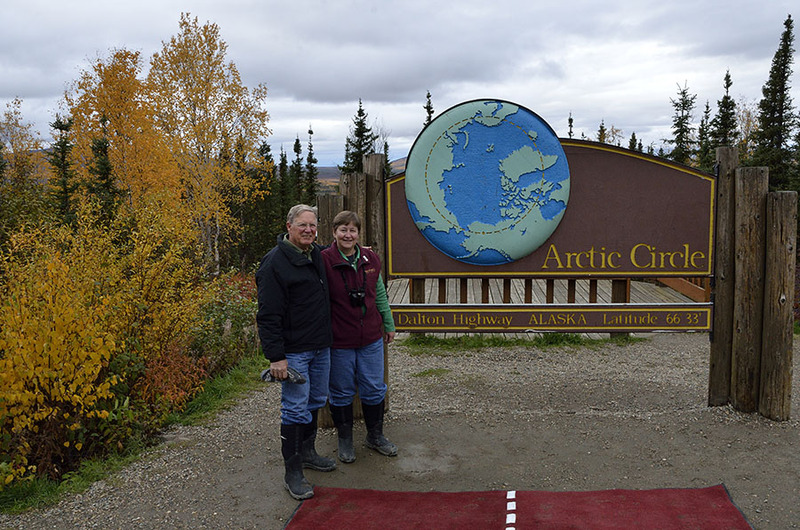 It’s hard to describe the adventure of a trip down the Dalton Highway, but it was a magnificent journey – so much to see and learn about, and we were glad to have an expert guide to explain so much. We crossed tundra, and taiga – Russian for “little forest” that describes the stunted black spruce that transitions from the Brooks Range to the boreal forest farther south. It felt odd to return to civilization in Fairbanks after the desolation and industrial feel of Prudhoe Bay, the wide open tundra, the pipeline, forests, blizzards, mud and sunshine along the way.